Goethite (FeO(OH); /ˈɡɜːrtaɪt/) is an iron-bearing hydroxide mineral of the diaspore group. It is found in soil and other low-temperature environments. Goethite has been well known since ancient times for its use as a pigment (brown ochre). Evidence has been found of its use in paint pigment samples taken from the caves of Lascaux in France. It was first described in 1806 based on samples found in the Hollertszug Mine in Herdorf, Germany. The mineral was named after the German polymath and poet Johann Wolfgang von Goethe (1749–1832). In 2003, nanoparticulate authigenic goethite was shown to be the most common diagenetic iron oxyhydroxide in both marine and lake sediments. Goethite is an iron oxyhydroxide containing ferric iron. It is the main component of rust and bog iron ore. Goethite's hardness ranges from 5.0 to 5.5 on the Mohs Scale, and its specific gravity varies from 3.3 to 4.3. The mineral forms prismatic needle-like crystals ("needle iron ore") but is more typically massive. Feroxyhyte and lepidocrocite are both polymorphs of the iron oxyhydroxide FeO(OH) which are stable at the pressure and temperature conditions of the Earth's surface. Although they have the same chemical formula as goethite, their different crystalline structures make them distinct minerals. Additionally, goethite has several high-pressure and high-temperature polymorphs, which may be relevant to the conditions of the Earth's interior. These include ε-FeOOH, which has an orthorhombic crystal structure, a cubic pyrite-type polymorph, and an ultradense hexagonal structure. Goethite often forms through the weathering of other iron-rich minerals, and thus is a common component of soils, concentrated in laterite soils. The formation of goethite is marked by the oxidation state change of Fe2+ (ferrous) to Fe3+ (ferric), which allows for goethite to exist at surface conditions. Because of this oxidation state change, goethite is commonly seen as a pseudomorph. As iron-bearing minerals are brought to the zone of oxidation within the soil, the iron turns from iron(II) to iron(III), while the original shape of the parent mineral is retained. Examples of common goethite pseudomorphs are: goethites after pyrite, goethite, siderite, and marcasite, though any iron(II)-bearing mineral could become a goethite pseudomorph if proper conditions are met. It may also be precipitated by groundwater or in other sedimentary conditions, or form as a primary mineral in hydrothermal deposits. Goethite has also been found to be produced by the excretion processes of certain bacteria types. Goethite is found all over the planet, usually in the form of concretions, stalactitic formations, oolites (a form consisting of tiny round grains cemented together), reniform (kidney shapes) or botryoidal (globular, like bunches of grapes) accumulations. It is also a very common pseudomorph. It is frequently encountered in the swampy areas at the head of spring waters ('bog iron'), on cave floors, and on the bottom of lakes and small creeks. The boxworks or gossan resulting from the oxidation of sulfide ore deposits is formed of goethite along with other iron oxides and quartz. Significant deposits of goethite are found in England, Australia, Cuba, and Michigan, Minnesota, Missouri, Colorado, Alabama, Georgia, Virginia, and Tennessee, and Florida caves in the United States. Deposits significant in location, if not in abundance, have been found in the Martian crater Gusev by NASA's Spirit rover, providing strong evidence for the presence of liquid water on the planet in an earlier stage of its evolution. In 2015 it was reported that limpet's teeth have goethite fibres in them, which accounts for their extreme tensile strength. Its main modern use is as an iron ore, being referred to as brown iron ore. It does have some use as a clay earth pigment. Iron-rich lateritic soils that have developed over serpentinite rocks in tropical climates are mined for their iron content, as well as other metals. Fine goethite specimens are rare and therefore are valued collectibles. Banded or iridescent varieties are cut and polished into cabochons for jewelry making. Perhaps the oldest known use of goethite comes from the ancient kingdom of Phrygia. In a royal tomb a body was found believed to be King Gordias, father of the legendary King Midas. The burial shroud had been colored with a dye containing goethite, which in its original unfaded state would have made the shroud look like it was woven from gold. Historians speculate that the legend of King Midas' golden touch might have originated from Phrygian royalty wearing clothes made from such golden-colored textiles. ^ Hurlbut, Cornelius S.; Klein, Cornelis (1985). Manual of Mineralogy (20th ed.). Wiley. ISBN 0-471-80580-7. ^ Van Der Zee, Claar; Roberts, Darryl R.; Rancourt, Denis G.; Slomp, Caroline P. (2003). "Nanogoethite is the dominant reactive oxyhydroxide phase in lake and marine sediments". Geology. 31 (11): 993. Bibcode:2003Geo....31..993V. doi:10.1130/G19924.1. ^ Suzuki, Akio (2010). "High-pressure X-ray diffraction study of ε-FeOOH". Physics and Chemistry of Minerals. 37: 153–157. doi:10.1007/s00269-009-0319-x. ^ Nishi, Masayuki; Kuwayama, Yasuhiro; Tsuchiya, Jun; Tsuchiya, Taku (2017). "The pyrite-type high-pressure form of ε-FeOOH". Nature. 547: 205–208. doi:10.1038/nature22823. ^ Zhang, Li; Yuan, Hongsheng; Meng, Yue; Mao, Ho-kwang (2017). "Discovery of a hexagonal ultradense hydrous phase in (Fe,Al)OOH". Proceedings of the National Academy of Sciences of the United States of America. 547: 205–208. doi:10.1073/pnas.1720510115. ^ Larese-Casanova, Philip; Haderlein, Stefan B.; Kappler, Andreas (2010). "Biomineralization of lepidocrocite and goethite by nitrate-reducing Fe(II)-oxidizing bacteria: Effect of pH, bicarbonate, phosphate, and humic acids". Geochimica et Cosmochimica Acta. 74 (13): 3721–34. Bibcode:2010GeCoA..74.3721L. doi:10.1016/j.gca.2010.03.037. ^ Webb, Jonathan (18 February 2015). "Limpet teeth set new strength record". BBC News: Science and Environment. BBC News. Retrieved 23 December 2016. ^ Rose, Brian. "Great Myths and Legends: The Golden Age of King Midas". Penn Museum. Retrieved 27 August 2016. 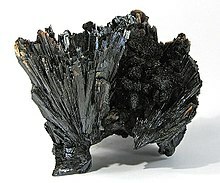 Wikimedia Commons has media related to Goethite. Spencer, Leonard James (1911). "Göthite" . Encyclopædia Britannica (11th ed. ).